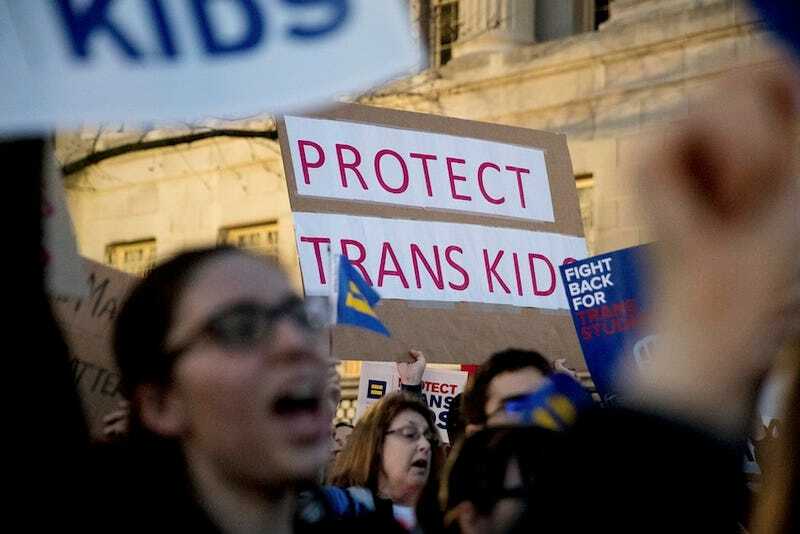 In yet another horrible turn of events for transgender rights in this country, the Trump administration rescinded an Obama-era policy that protected the rights of transgender students to use the bathroom of their choice. The Washington Post reports that the federal Education and Justice departments instructed the Supreme Court Wednesday night to ignore the memos from the previous administration that said that preventing transgender students from using the bathrooms that correspond with their gender identity is a violation of anti-discrimination laws. The “Dear Colleagues” letter that will be sent to public schools nationwide offers no guidance to the schools, but explains that the protections were lifted because they weren’t publicly vetted, lacked proper legal analysis and “drew legal challenges,” the Post reports. The decision to roll back these protections was at the center of a debate between U.S. Attorney General Jeff Sessions and Secretary of Education Betsy DeVos, the New York Times reports. Sessions pushed for quick action against the protections, due to pending court cases like that of Gavin Grimm, the Virginia teenager whose battle to use the boys’ bathroom has been ongoing for two years. Sources tell the Times that DeVos was apparently reluctant to sign off on the letter because she feared the “potential harm” that revoking these protections would cause to transgender students. The issue was then escalated to the White House where Trump took Sessions’ side and DeVos eventually had to give in. The headline has been edited to reflect that the Trump Administration and not Donald Trump himself lifted the federal protections for transgender students’ bathroom use. Jezebel regrets the error.